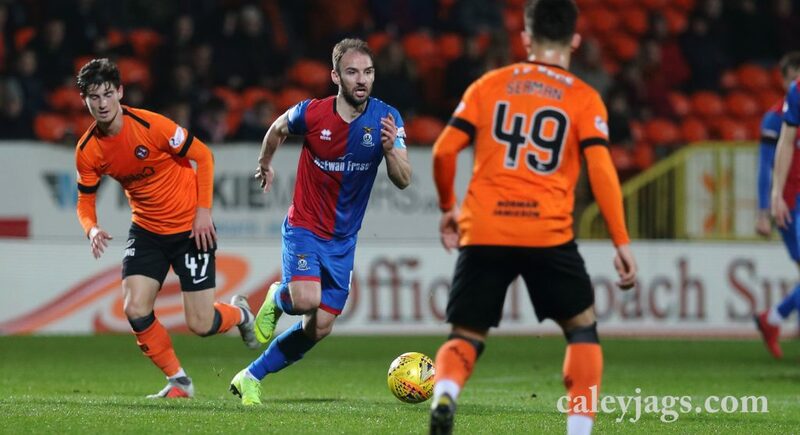 Nicky Clark’s second half penalty was enough for Dundee United to take all three points against Caley Thistle, in a tight affair at Tannadice Park. 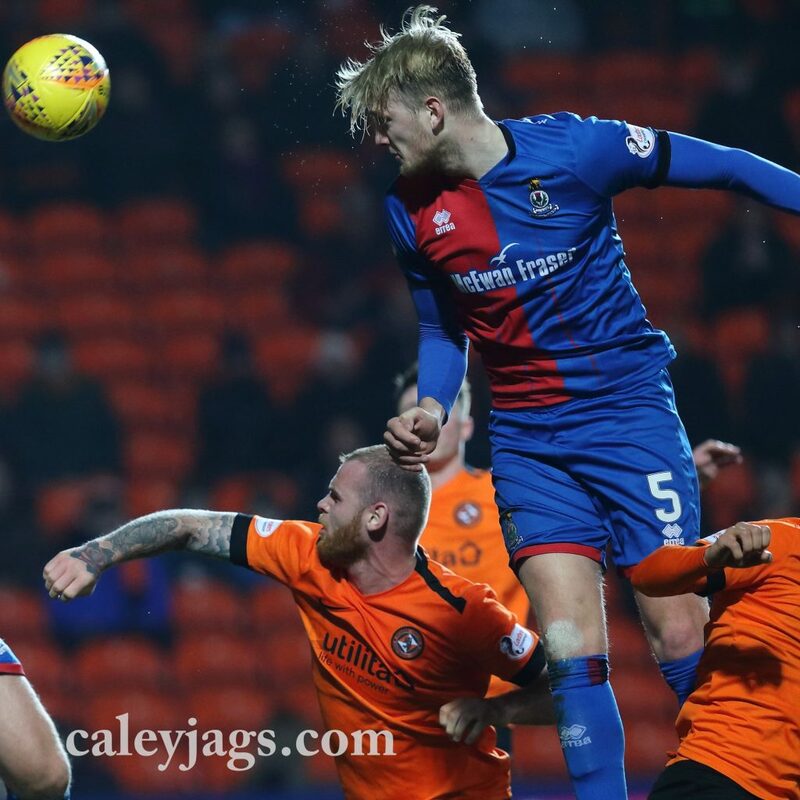 The Caley Jags will feel unlucky not to have taken a point from the match after creating opportunities in the second half. The result sees United move to second in the Championship table, while Inverness remain fourth. United started well as Peter Pawlett fired over after just four minutes and Charlie Seaman saw his effort go inches wide on the 7th minute. Harkes then found Clark at the back-post but the striker couldn’t quite turn his effort on target. ICTFC began to grow into the match and Liam Polworth forced a corner after meeting Shaun Rooney’s cross. From that corner, Rooney went close as he headed Chalmers’ ball over the bar. There was some good play from Nathan Austin down the left hand side on the 31st minute as he cut inside and shot but his effort was held by Siegrist. Coll Donaldson was presented with a good chance on the 33rd minute as he headed Liam Polworth’s cross over the bar. 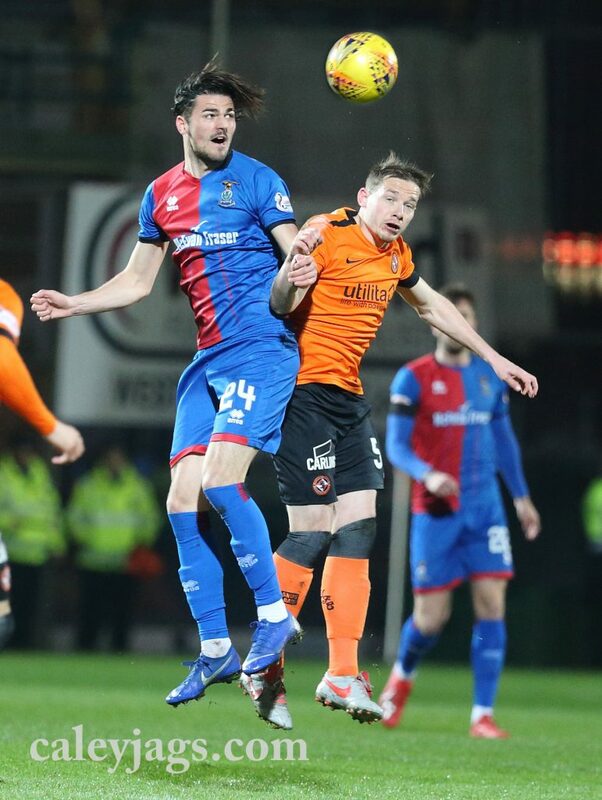 On the 35th minute, United were close to taking the lead in bizarre circumstances as Pawlett charged down Ridgers and the Caley Jags keeper’s clearance bounced narrowly wide off Pawlett for a goal kick. It was scoreless at the break and the second half started with both teams having chances. Nicky Clark saw his effort saved by Ridgers on the 47th mark while Liam Polworth’s long range strike was just over on the 53rd minute. On the 55nd minute, a great ball from Joe Chalmers found Austin in the middle but his flicked on header couldn’t quite reach Jordan White. Joe Chalmers was presented with a chance on the 58th minute as Welsh’s cross found him the box but his shot was cleared. 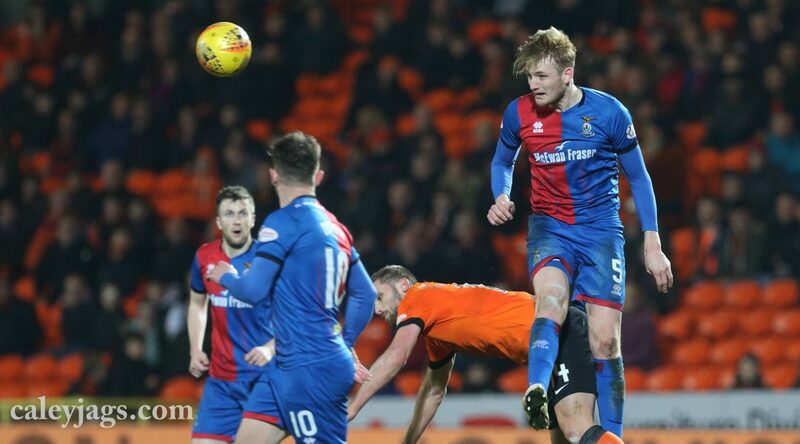 Caley Thistle contiuned to pile on the pressure as Shaun Rooney picked out Nathan Austin in the middle but the striker’s header was straight at Siegrist. 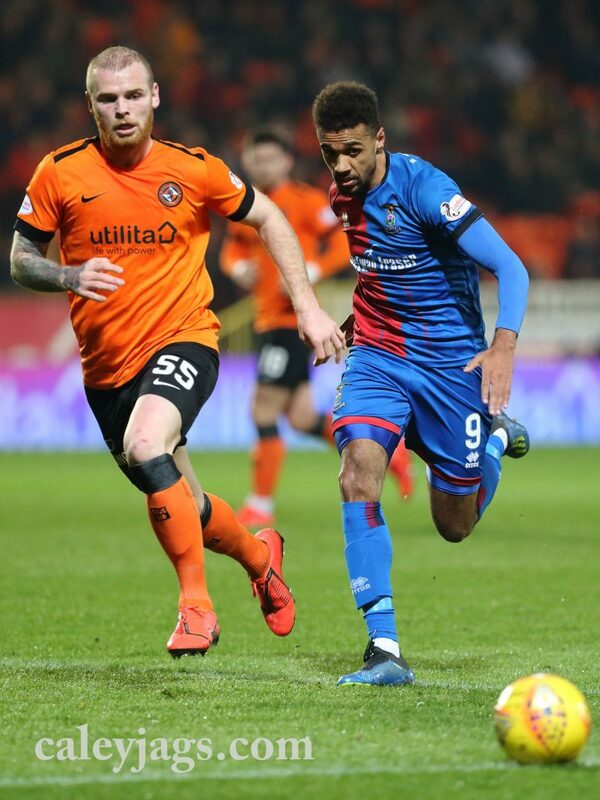 Dundee United were awarded a penalty on the 67th minute as Coll Donaldson fouled Nicky Clark in the box. Clark stepped up and sent Ridgers the wrong way to open the scoring. Shortly afterwards, United were reduced to ten men as Peter Pawlett was given his second yellow of the match for a foul on Kevin McHattie. John Robertson the brought on Aaron Doran as he replaced McHattie. Caley Thistle then threw everything at United in the closing stages, Austin went close with a header, as he met Joe Chalmers’ cross, but Siegrist collected it. Darren McCauley then replaced Charlie Trafford for the final seven minutes of normal time and added time. 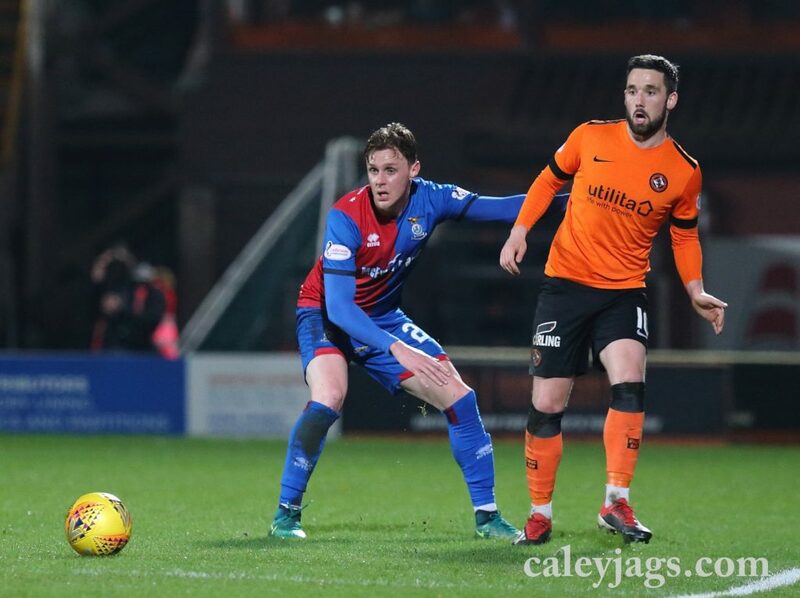 Sean Welsh saw his effort turned behind for a corner to the Caley Jags but United got it clear. Daniel Mackay replaced Joe Chalmers late on as Caley Thistle kept pressing for an equaliser. Coll Donaldson saw his deflected effort tipped over for a Caley Thistle corner and with Mark Ridgers up for the final corner of the match, Shaun Rooney’s header was inches wide of the post with the last touch of the match. Caley Thistle travel to Tannadice again on Sunday as they face United in the Scottish Cup Quarter Final.